EAST STROUDSBURG – At State Representative Rosemary M. Brown’s (R-Monroe/Pike) recent Veterans Celebration event on Nov. 7, Delaware Township Supervisor and Vetstock Chairman Tom Ryan presented a check for $1,000 to American Legion Post No. 514 for the purchase of an automatic external defibrillator (AED) for its facility. Vetstock is a nonprofit organization that raises money diligently to help veterans. “This is just a small way Vetstock can help support our local veterans through emergency preparedness,” Ryan said. Rachel Moyer helped to procure the AED through her foundation, which was founded in memory of her son, Gregory, who lost his life at age 15, from sudden cardiac arrest. 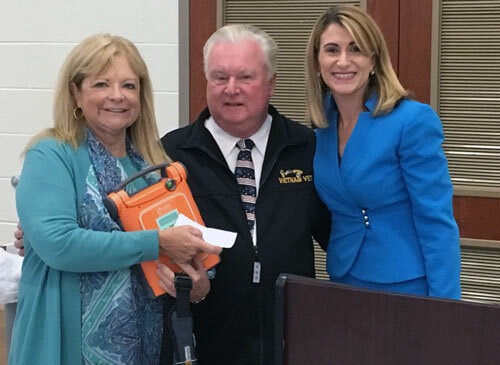 After her son’s death, Moyer’s mission has been to educate society on AEDs and to have more AEDs readily available in schools and public areas to quickly respond to sudden cardiac arrest events. She has also worked with Brown on AED legislation and Act. 35 in 2013. Moyer, Ryan and Brown are pictured (from left) in the attached photo. For more information about AED awareness in Pennsylvania, or any state-related issue, contact Brown’s district office in East Stroudsburg located at 143 Seven Bridge Road, by calling 570-420-8301. Information can also be found on online at RepBrown.com or Facebook.com/RepRosemaryBrown.